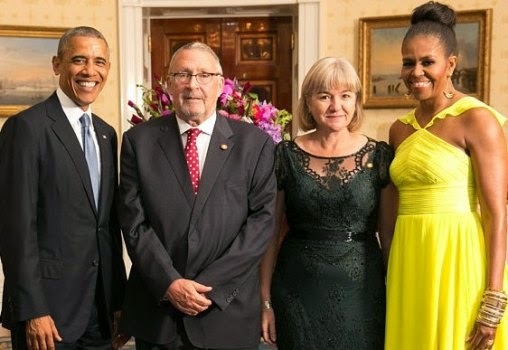 Guy Scott (pictured above with his wife and the Obamas) was sworn in today as the interim president of Zambia following the death of Zambian president Michael Sata yesterday Oct. 28th. This makes Mr Scott, who is of Scottish descent but born in Zambia, the first white president in Africa since apartheid. Guy Scott, 70, became vice-president of Zambia in 2011 and will serve as interim-president pending when the country holds fresh elections for a new president within 90 days. The Zambian constitution makes it impossible for Scott to be president because his parents were not born in Zambia.